Low-cost airlines have been on the rise in Europe for quite some time. For nearly three decades, the Low-cost concept has revolutionized the airline industry and forever changed the landscape of European air travel. Over time, LCCs have diversified their product offerings and have evolved into much more than the no-frills airlines of 20 years ago. Low-cost airlines in Europe struggled to obtain market share in the early years. The traditional Legacy carriers dominated the skies and were often protected by their national governments—two large obstacles standing in the way of success for the Low-cost concept. Today, however, LCCs have become an important and integral part of the European air travel market, which they’ve helped to democratize. Flight-Report.com, a site where every day flyers post detailed airline reviews, has compiled the grades given by flyers in reviews and ranked the European LCCs on passenger experience (#PaxEx) from best to worst. Interestingly, each Low-cost carrier in the top 3 positions operates a fleet of Boeing 737s. 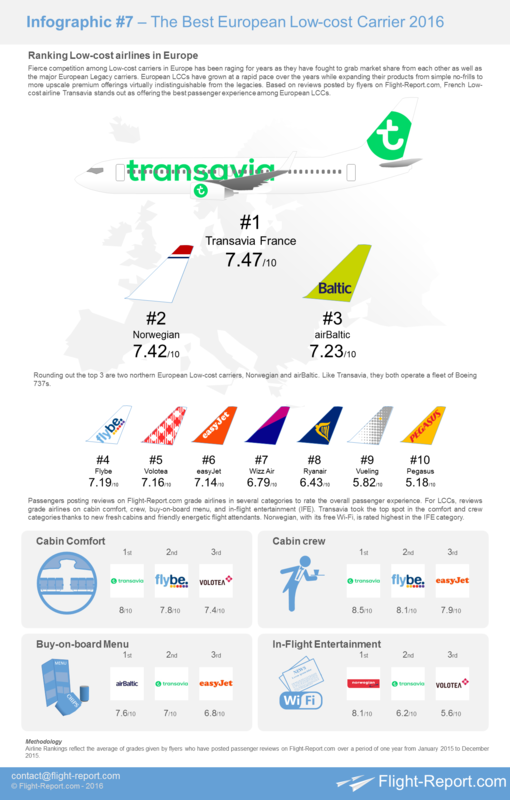 Transavia France came out on top as the best rated European Low-cost carrier by reviewers on Flight-Report.com. The airline is seem as offering good value for money. Having introduced an updated and modernized livery last year, and with its fleet of new Boeing 737s with Boeing Sky Interior, Transavia has a fresh and youthful image. Based on reviewer comments, the crews tend to be youthful, friendly, and energetic. Despite some difficult social obstacles put in place by unions from parent company Air France, Transavia has continued to grow. 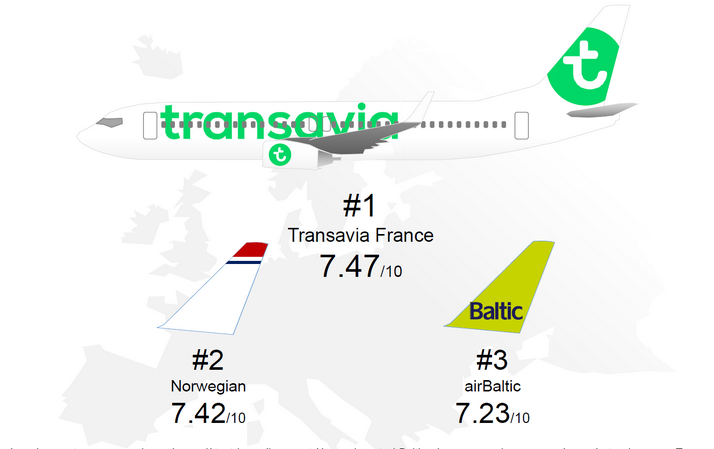 Based on an average of grades given by reviewers, Transavia ranked best overall in the cabin comfort and cabin crew categories. The overall average rating for all 4 categories is 7.47 points out of 10, giving the French LCC a slight edge over the next two highest ranked carriers. Two Northern European LCCs round out the top three: Norwegian with an average overall rating of 7.42/10 and the much smaller airBaltic with 7.23/10. Both of these carriers scored highest in different areas. Popular Norwegian took the top spot over all other European LCCs in the In-flight Entertainment (IFE) category. The Scandinavia Low-cost offers free Wi-Fi onboard its large 737 fleet. Ove the past several years, Norwegian has grown by leaps and bounds following a historic order for 250 Boeing aircraft, which includes 737s and 787 Dreamliners. The fleet of ultra-modern 787s has opened up many Transatlantic and Asian routes for the carrier. The Boeing 737s are not only operating intra-European routes, but have also been flying routes from North America to the Caribbean. Norwegian’s growth will continue with new routes being launched this summer from Paris to New York, Fort Lauderdale, and Los Angeles. Compared to Norwegian, 3rd place airBaltic does not have the same long-haul international aspirations, but nevertheless ranks highly in customer satisfaction. This smaller boutique LCC ranks highest of the European LCC in the Buy-on-board category. A nice variety of meals, with both hot and cold options, can be pre-ordered at reasonable prices—this convenient feature appears to be popular with the flying public. Flybe just missed the top 3 podium with its overall grade of 7.19/10, with Volotea close behind with 7.16/10. Both airlines are known for having comfortable aircraft with Flybe operating a fleet of Embraer E-jets offering comfortable 2X2 seating, and Volotea operating a fleet of the rare Boeing 717 in a comfortable 2X3 seating layout. Volotea is known for its enticing low fares, positioning the Spanish carrier as offering a good value-for-money proposition. European Low-cost giant easyJet ranked 6th overall with a respectable average grade of 7.14/10. easyJet enjoys a generally positive image as is seen by many flyers are being more Business-travel-friendly than other LCCs, as it serves primary hub airports such as Paris-CDG. The ever-so-orange airline consciously caters to Business travelers by offering a several Business-friendly and premium options for purchase. The airline has also been updating its cabin interiors as of late. Towards the bottom of the ranking we find Wizzair with a score of 6.79/10, the behemoth Ryanair with 6.43/10, Vueling with 5.82/10, and Pegasus with 5.18/10. Hungarian Low-cost Wizzair ranks rather low despite its colorful and modern branding. Operating a fleet of airbus narrowbodies, Wizzair flies to many destinations in Europe, Russia, and the Middle East, however, like our next airline in the rankings, Ryanair, it flies to mainly secondary airports, such as Paris-Beauvais BVA and Dubai DWC. Irish Low-cost Ryanair, is by far the largest of the European LCCs. Ryanair was the first to popularize the Low-cost concept in Europe. For decades, Ryanair grew to become one of the largest and most profitable airlines on the continent. Despite their success, however, Ryanair has never had a particularly customer-friendly image. For decades, Ryanair was unapologetic about its you-get-what-you-pay-for attitude towards no-frills air travel. Today, amidst so much new competition in the LCC sector, Ryanair is looking to move upmarket. Some evidence of this can already be seen with the new Boeing Sky Interiors of its newest aircraft. Ryanair is also beginning to move away from its model of serving only secondary airports and eyeing major European hub airports. Will we one day see a Ryanair 737MAX fleet in CDG and LHR? Vueling’s and Pegasus’ scores placed them at the bottom of the European Low-cost carrier pile. Spanish LCC Vueling has grown tremendously in past years, taking advantage of European Open Skies agreements. Despite the growth and success, passengers often complain about uncomfortable seating with knee-crushing legroom. Vueling is known for offering very low fares—it goes to show that many passengers are willing to compromise on comfort for low fares when it comes to short-haul flights. Pegasus is a Turkish Low-cost carrier with its main hub at Istanbul’s second airport, Sabiha Gokcen (SAW). This strategic location allows the carrier to serve many destinations in Europe and the Middle East with its mixed Boeing 737 and Airbus A320 fleet. Connecting from Western Europe to the Middle East on a Low-cost carrier has proven to be long and unpleasant for many passengers who have graded Pegasus poorly in their reviews. The Turkish LCC has a large order for a new fleet of Airbus A320neo and A321neo aircraft; perhaps the new aircraft will drive improvements in the passenger experience. Airline Rankings reflect the average of grades given by flyers who have posted passenger reviews on Flight-Report.com over a period of one year from January 2015 to December 2015. These results are based on average grades given by reviewers at flight-report.com. Searching for flight reports on Transavia France only yields 2 reports. Does that mean the average grades are determined solely on these 2 as well?